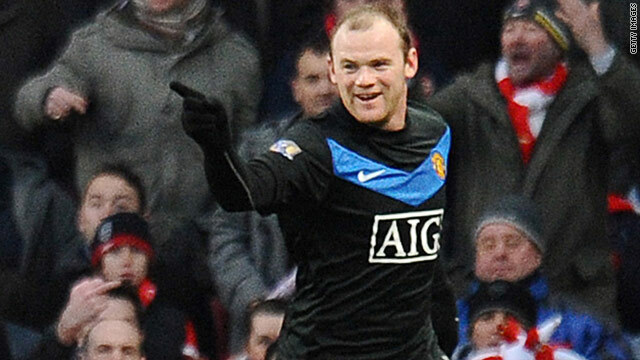 Wayne Rooney celebrates scoring his 100th Premier League goal in Manchester United's superb 3-1 win at Arsenal. (CNN) -- England striker Wayne Rooney scored his 100th English Premier League goal to help Manchester United keep their title hopes alive with a stunning 3-1 win at rivals Arsenal. The in-form Rooney, who had scored 22 goals in all competitions this season prior to the match -- including four against Hull City last weekend -- achieved the milestone with United's second goal, a brilliant finish following a devastating counter-attack. United, who won by the same scoreline at the Emirates in last year's Champions League semifinal, needed a victory to keep pace with Chelsea at the top of the table -- and they took a 33rd-minute lead with a moment of skill from Portuguese winger Nani. Nani, who has failed to establish himself as a regular during his time at Old Trafford, flicked the ball past Arsenal's Gael Clichy and Samir Nasir on the right wing, before producing a delicate lob that goalkeeper Manuel Almunia could only palm into his own net. And United doubled their lead four minutes later when Nani out-stripped the Arsenal defence on the break and Rooney -- who had started the move -- ran half the length of the pitch to be on hand in support to fire past Almunia. "This is the time of the season we really need to kick on and it was an impressive result. Arsenal continued to press forward looking for a way back into the match, but once again they were caught on the break as this time Korean Ji-Sung Park burst through a huge gap in the home defence to slide home the decisive third goal early in the second half. United had chances to increase their advantage with both Rooney and Nani close to adding a fouth, but it was Arsenal who claimed a late consolation when Thomas Vermaelen's shot found the net after taking a deflection off Jonny Evans. "That was a great performance by us. We played really well," United manager Sir Alex Ferguson told Sky Sports. "This is the time of the season we really need to kick on -- and it was an impressive result. We were sharp and incisive and could have scored more. "But we are still behind Chelsea and I hope that Arsenal go there and batter them next Sunday!" The result means United remain a point behind Chelsea at the top of the table, although the London side have a game in hand -- at Hull on Tuesday. Arsenal are now five points behind Chelsea in third place having played a game more and, if Chelsea win in midweek, that gap will increase to eight points ahead of the two sides meeting at Stamford Bridge next Sunday. It proved a good day for Manchester as United's rivals City maintained their push for a Champions League place with a comfortable 2-0 home win over crisis-club Portsmouth. Bottom-of-the-table Portsmouth -- who agreed to sell defender Younes Kaboul to Tottenham this weekend just so the wage bill could be paid -- went behind when Emmanuel Adebayor fired City ahead with his first goal since his traumatic experience with Togo at the Africa Cup of Nations in Angola. And City made the points safe on the stroke of half-time when Vincent Kompany powered a header past goalkeeper David James from Martin Petrov's corner.